430 pages | 84 B/W Illus. Just five years ago, it was generally believed that the number of food insecure people in the world was on continuous decline. Unfortunately, widespread soil degradation along with resistance to recommended agronomic practices, and little attempt to restore degraded soils have conspired with significant droughts (in regions that could least tolerate them) to swell the ranks of the food insecure to over a billion people. The U.N. Millennium Development Goals’ intent to halve hunger by 2015 will not be realized. Rattan Lal is a professor of soil physics in the School of Natural Resources and Director of the Carbon Management and Sequestration Center, Food, Agricultural, and Environmental Services/Ohio Agriculture Research and Development Center, at the Ohio State University. Before joining Ohio State in 1987, he was a soil physicist for 18 years at the International Institute of Tropical Agriculture, Ibadan, Nigeria. 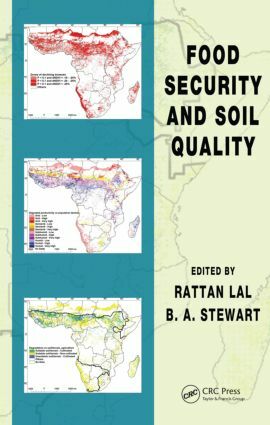 In Africa, Professor Lal conducted long-term experiments on land use, watershed management, soil erosion processes as influenced by rainfall characteristics, soil properties, methods of deforestation, soil-tillage and crop-residue management, cropping systems including cover crops and agroforestry, and mixed/relay cropping methods. He has served on the Panel on Sustainable Agriculture and the Environment in the Humid Tropics of the National Academy of Sciences. He has authored and coauthored about 1400 research papers. He has also written 13 and edited or coedited 45 books. B. A. Stewart is a distinguished professor of soil science at the West Texas A&M University, Canyon, Texas. He is also the director of the Dryland Agriculture Institute, and a former director of the USDA Conservation and Production Laboratory at Bushland, Texas; past president of the Soil Science Society of America; and member of the 1990–1993 Committee on Long-Range Soil and Water Policy, National Research Council, National Academy of Sciences. He is a fellow on the Soil Science Society of America, American Society of Agronomy, Soil and Water Conservation x Editors Society, a recipient of the USDA Superior Service Award, a recipient of the Hugh Hammond Bennett Award of the Soil and Water Conservation Society, and an honorary member of the International Union of Soil Sciences in 2008.